First-year UA College of Medicine – Phoenix medical students can learn more about ophthalmology by participating in our global health humanitarian outreach project. Robin Ross, MD, an ophthalmologist and director of Global Outreach at the college, leads a group of approximately 15 medical students to the Dominican Republic twice per year. 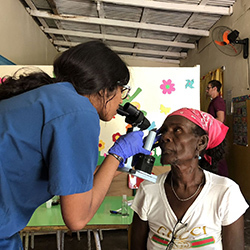 In May 2018, the group of health professionals offered free vision exams at the primary care clinics (bateyes) they visited. Over the years, these clinics have been established in several rural communities. Other volunteer faculty from primary care emphasize bedside history taking and the skills the students learned in their Doctoring Course. This was the first year that the group brought a Goal Zero/Yeti battery and solar panels. This allowed students and faculty to charge their ophthalmology equipment. They also brought six iPads for note taking in the field. Over the spring's week-long trip, students and faculty examined between 300-500 patients, many who have limited access to medical care. The Global Health Outreach Group brought 70 pairs of reading glasses to donate, but they are so needed, the supply only lasted one day. This trip makes a lasting impact on the medical students, faculty and community. Through teaching, volunteering and caring for patients, it fosters a foundation of serving others and improving health in several villages in the Dominican Republic. Patients who thought their vision was gone forever are delighted when they get their first pair of reading glasses and are able to see again. This was the first time ophthalmology was introduced in the very first year of the medical school curriculum. Future fundraising efforts will include money to subsidize the $1,500 cost per medical student to participate in the project, money for oto/ophthalmoscopes, an ICare or Tonopen device and a donation drive with a goal of collecting 300 pairs of reading glasses for the next trip to the Dominican Republic. Funds for scholarly projects in ophthalmology are also being sought for medical students. Other items for fundraising are included on the Global Health Student Interest Group page.